steam-user v4 is now in beta, meaning that it's (fairly) stable. The beta can therefore now be installed from npm. To install it, run npm install [email protected], or put "steam-user": "beta" in your package.json. The beta is minimally-tested, so please don't use this in production applications yet. There are a lot of breaking changes in v4. See the release notes on GitHub for all of the changes. Please post feedback or bugs either here or in the pull request comments. Edited by Dr. McKay, 30 January 2019 - 12:43 AM. is there any way to check the number that the user got using /Random? bot receives message from <sid>: [random min="1" max="1000" result="872"][/random] // here I am sending "/Random 1000"
bot receives message from <sid>: [random min="1" max="1000" result="1000"][/random] // here I just send the string "[random min="1" max="1000" result="1000"][/random]"
I look forward to when steam-user v4 will be able to send pictures, links, emoticons, etc. The result is the result of the random (same in /flip). In the second line of that block, the resulting random number was 872. 'OS' is improperly capitalized in line 38 of components\helpers.js (getInternalMachineID)? Edited by byteframe, 17 January 2019 - 11:59 PM. Beta 2 fixes OS capitalization. Does the 'joinGroup' function to join a group chatroom function yet? It appears that it might be unimplemented. Uhhh, good catch. It should work, but you won't get a response back yet. Beta 3 is now on npm. Now featuring (most of) the docs for the new chat API! Could this be due to the fact that I use 'graceful-fs' instead 'fs'? You have too many open files. I got some error (when I didnt in maybe beta 1 or beta 2) when calling getInviteLinkInfo. I no longer need to call that function and didnt remember to copy the error. the 'processChatGroupState' call in 'getInviteLinkInfo' (line #120) fails because the 'chat_rooms' property of the state object is undefined. I think I saw it in another place from the info result, so maybe something changed. Other than that, the chat stuff in so far as I'm been using it is working well. I like it! This is fixed in beta 4. Thanks for the detailed info. Hi, still has problem with auth in version 4. Login takes too long time, and not saved guard code from e-mail, i need enter guard code from email every time, in the version 3.0 it's work better. Thanks for the info, that's fixed in beta 5. With beta 5, steam-user v4 is now feature-complete (unless there's something major I missed). Now just waiting on some more thorough testing (please post your bugs!) and for me to finish the new chat docs. Edited by Ino, 23 January 2019 - 03:59 AM. Edited by Ino, 23 January 2019 - 05:47 PM. Yes, that's normal. Originally v4 was going to fill in all values not sent by Steam with their defaults (e.g. 0 or empty string) but I decided against that and switched those values back to null (which is how it works in v3). 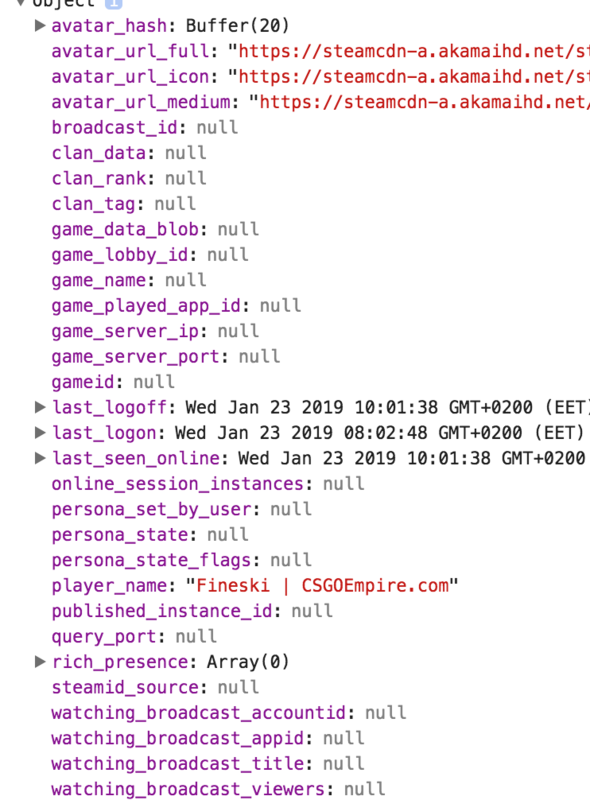 Null means that those values were not sent to us by Steam at all, which is more correct than "assuming" 0 or empty string. Do you think you will 'port' the chat code to node-steamcommunity? What's the future of the relationship between these two modules going forward? Chat code will never be ported to node-steamcommunity. The new webchat is just a CM WebSocket connection established using a nonce retrieved from a web API. 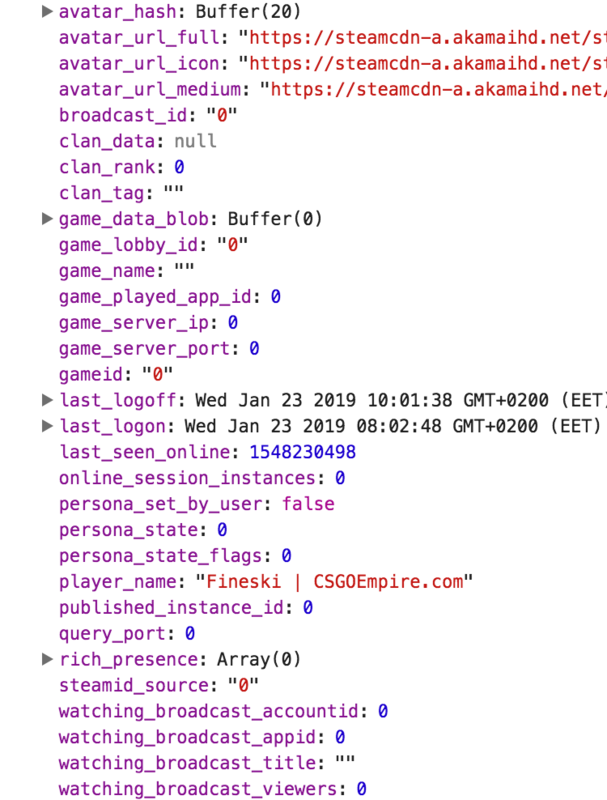 The same CM WebSocket connection is used by steam-user, so porting it to node-steamcommunity would basically just be copying and pasting all of node-steam-user. I may, in the future, add a way to get the nonce from node-steamcommunity in order to login to node-steam-user, but that's about all that would make sense to be done.